Starting this thread to get the ball rolling on photography gear/industry. Certainly jump in with whatever you find appealing or exasperating about the industry, your own gear, what you want to get, etc. Doesn't have to flow with what I post for sure. So ever since Sony came out with their A7R III full frame mirrorless camera and seeing what it can do, 42 MP sensor, 10 fps, eye focus, body stabilization, etc, I have been thinking about switching from Canon less they release their own competing model. The price tag of $3300 is a huge investment though along with the $2200 24-70 f/2.8 Zeiss lens they offer as well which is said to take really sharp photos even compared to Canon's renown model. However, they have now announced the entry level model for two grand and this is making the temptation to switch even more pronounced given it has some of the features of their latest pro models without sacrificing too much. Canon has come out with their consumer mirrorless model in the M50 which is a 24 MP APS-C sensor camera with 4k video for ~$800 and hopefully this means they are working on a professional full frame model in the near future. So unless I hear something by Black Friday/Christmas, I think I will make the jump to Sony. I've went to B&H and held their cameras, and they are pretty light and comfortable to use. If you read the venting thread, you will know I just sold my Canon 6D II released last year which I am definitely glad that I did. It is a $2k camera (which I got for $1300, but that's besides the point) which has the features and quality of a camera made perhaps four years ago. Canon needs to stop being afraid of killing sales for their 5D IV and 1D X II pro models and compete with other companies. Following the recently refreshed A7R III, tonight Sony announced its "basic" model update with the A7 III mirrorless camera. This time around it's packing a 24.2 MP sensor, internal 4K HDR video capability (downscaled from 6K) and what Sony says is the longest rated battery life of any mirrorless camera thanks to its Z series battery. It will cost $2,000/£2,000 for the body alone when it goes on sale in Europe in March and in the US this April, or as a kit with FE 28‑70 mm F3.5‑5.6 lens for $2,200/£2,200. That's a bit pricier than the A7 II was when it was introduced in 2014, but the list of improvements justifying it is long. Owners will find items like dual SD slots, a USB-C port as well as microUSB , HDMI and wireless connections via WiFi, NFC and Bluetooth. The BIONZ-X processor is 1.8 times faster than its predecessor's chip, and the camera has pulled in a 693-point autofocus system from Sony's A9 model. It also shares a frame with that camera (and the A7R III) so it's ready for all E-mount accessories. Interestingly, since the A7 III has Sony's absolute latest autofocus system, it actually works a bit better than the one on the A7R III, the company said, yielding faster focus with less "wobble." It also does a full sensor readout for 4K video, unlike the A7R III, which can only readout an APS-C-sized chunk of the sensor (full-frame 4K is possible with the A7R III, but results in less sharp, pixel-binned video). This camera can shoot full resolution pictures at up to 10fps and has a quad-VGA OLED viewfinder. While it doesn't match Sony's A9 for speed or the A7R III in resolution, the so-called "basic" model still pulls enough of their capabilities for it to appeal to photographers at a more affordable price. Pre-orders begin Wednesday morning. Ok, a few weeks ago I bought a Sony a6000 mirrorless APS-C camera which is four years old now and it is actually blowing me away. One of the features it has is focus peaking which is amazing as it shows a white static band on where the lens is focused on. I had originally just planned to use this camera as something to have in my pocket which with the 16-55mm kit lens, is pretty damn light and compact compared to the Panasonic GX85 I had before which was very heavy. Anyway, I have some old Canon manual focus lenses and focus peaking is a tremendous help. Add in the magnifier to make sure and it makes for a rather sharp image. 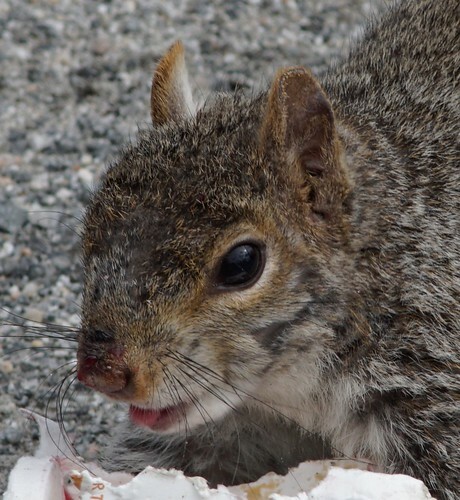 Here is a cropped image of a squirrel that I took using a Canon FD 200mm f/4 SSC manual focus lens. I didn't do anything else to the image like color correcting, but in the end, if I can get images like this with such a small set up, why am I bothering with Canon and their big DSLR bodies and comparatively larger lenses? Ugh, so much money spent in my search for my preferred set-up. Definitely goes to show that the high price tag doesn't necessarily matter. Rest of my equipment that I use? Easily $4k+. This doesn't go into the stuff that I don't really use or that I bought specifically to clean up and resell. This is certainly a personal problem where I am prone to hoarding gear (like buying a bunch of different mouthpieces for a trumpet). Then there is the fact that Sony release the entry level full frame mirrorless camera in the A7 III that is only two grand, but still packs a lot of useful features and Tamron is coming out with a 28-75mm f/2.8 lens that should be relatively lighter than other comparable lenses. I can envision that as my main camera with the a6000 as my back-up. But I'm so heavily invested in Canon mount lenses that it is hard to switch and certainly makes it easier to wait for Canon to come out with their competing mirrorless camera.